Visitation allows family and friends to gather and give everyone the opportunity to say goodbye and offer their support and sympathy to the bereaved. 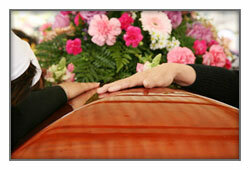 Funeral or Memorial Services can take place at a funeral home, in a church, or other meaningful location. The service is a ceremony which serves to celebrate, honor, and remember the life of the deceased. Whether traditional or unique, both the visitation and the funeral service can be personalized to reflect the individuality of your loved one. For more information on personalization, visit our page on Celebrating Life. Graveside or Committal Services are held at the cemetery and allow family and friends to be present as their loved one is transferred to his or her final disposition through earth burial. When a family chooses burial, the funeral service is traditionally designed to involve three distinct phases: visitation, the funeral, and the burial service. 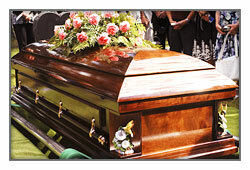 These generally follow the casket from the funeral home through the final burial at a cemetery. While this arrangement works for some families, it’s not the only option available and it might not be the ideal solution for others. We’ll work with you, understand your needs and create the perfect plan for you and your loved one.